Lloyd de Witt Bockstruck began serving as the senior ranking faculty member of the Institute of Genealogy and Historical Research, Samford University in 1974, a position in which he served for 39 years. He served on the faculty of the Genealogical Institute of Mid-America, University of Illinois at Springfield for 11 years beginning in 1994. He authored the genealogical column, “Family Tree,” in the Dallas Morning News, Dallas, Texas, for 17 years. He also served 17 years as an Instructor at the School of Continuing Education, Southern Methodist University in Dallas. He became a Fellow of the National Genealogical Society in 1992. 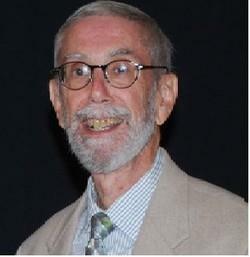 In 1994, he was named Outstanding Alumnus of the Institute of Genealogical and Historical Research. Bockstruck was named as a Fellow of the Texas State Genealogical Society in 2008. He received the Filby Prize for Genealogical Librarianship in 1999, which was followed in 2003 with the Northeast Texas Library Systems Lifetime Achievement Award. Mr. Bockstruck published 11 books of compiled genealogical records, as a result of his travels to repositories throughout the nation. He was a frequent speaker for genealogical societies and lineage organizations. He was an officer [often serving as registrar] and valued member of more than 20 lineage and/or hereditary organizations including Sons of the American Revolution and the Jamestowne Society. Originally from southern Illinois, Mr. Bockstruck earned an M.A. in European History from Southern Illinois University at Carbondale and an M.S. in Library Science from the University of Illinois at Urbana-Champagne. Mr. Bockstruck oversaw the genealogy department of the Dallas Public Library for 30 years, during which time he greatly expanded the Library’s genealogical holdings. He died in Dallas on 27 May, 2018 at the age of 73. Nancy Wright Brennan is a native of San Antonio and a graduate of Our Lady of the Lake University. She had a 26- year career with the City of San Antonio, retiring in 1997. She has served three terms as President of the San Antonio Genealogical & Historical Society and was President of the Texas State Genealogical Society. She was the Registrar General of The National Huguenot Society and presently serves as its Genealogist General. She is President of the Huguenot Society of Texas. She was the Regent of San Antonio de Bexar Daughters of the American Revolution and served as Texas State Chair and National Vice Chair of the Volunteer Genealogists Committee for DAR. She is a member of numerous lineage societies and serves as officer in several. Judge Edward F Butler, Sr.
His genealogical activities have led to his inclusion in Who’s Who In America (Marquis 2010-2011) & Who’s Who In The World (Marquis 2011). He served as President General of the National Society Sons of the American Revolution (2009-2010); Chairman of the Board of the SAR Foundation; Order Of The Founders Of North America 1492-1692; Founder and Charter Grand Viscount General 2013-2014; C.A.R – Honorary VP General; Mexico Society, SAR – Founder; Charter. President & Nat’l Trustee (2002); Spain Society, SAR – Founder; Charter. Chancellor (2010); France Society, SAR – Honorary President General, 2009-2010; Int’l Society, SAR – President, 2002-2004; Sovereign Military Order Of The Temple Of Jerusalem (Knight Templars), Dep. Grand Prior; Royal Society Of St. George (Mar. 2003-2006) – Chartering. Secretary; Society Of Colonial War – Dep. Governor General -Texas Soc. Govenor (2004-2005); Sons Of The Revolution – President Of The Texas Society – VP General; The Society Of The War Of 1812 – JAG – 2011-2014, VP General 2006-2008, Texas Society President 2004-2006; Magna Charta Barons -Regent Of The San Antonio Colony; Order Of The Founders And Patriots Of America – Governor of The Texas Society (2014-2016); Society Of The Descendants Of Washington’s Army At Valley Forge – Nat’l JAG, 2002-2003- Texas Brigade Inspector; First Families Of Maryland (2011 –Governor Texas Society – 2013 – Present-Chancellor General – 2014 – Present; Sons of Confederate Veterans – Camp Commander; and the Military Order of the Stars and Bars – Chapter President. He is also an active member of The Sovereign Colonial Society, Americans Of Royal Descent; The Plantagenet Society; The Society Of Descendants Of Knights Of The Most Noble Order Of The Garter; Sons And Daughters Of The Colonial And Antebellum Bench And Bar; Order Of Charlemagne; Military Order Of The Crusades; The Boones borough Society; First Families Of North Carolina; The Society Of The Sons And Daughters Of The Pilgrims; Colonial Order Of The Crown. He has written three family history books, one of which won the Dallas Genealogy Society Award. His first history book about the American Revolutionary War has already won five awards, and he has recently published a new book. Lawrence King Casey, Jr, a resident of Beaumont, Texas for 50 years, is currently active in genealogy and 53 hereditary societies. He has led five Texas Societies (including Order of the Founder and Patriots of America, Colonial Wars, Sons of the Revolution, & 1812). Nationally he served as President General of the General Society of the War of 1812 for three years during the Bicentennial. He also served as the national leader for the Order of the First Families of Maine, Plymouth Hereditary Society, and The Order of Descendants of the Ancient and Honorable Artillery Co. of Boston. He is a retired LTC having served the US Army Reserve for 28 years, including a tour in Korea. In Masonic organizations, he received the Knight York Cross of Honor in Beaumont, and the 33rd Degree Inspector General Honorary from the Scottish Rite in Galveston. He is a member of the Order of Kentucky Colonels, Honorary Admiral in the Texas Navy, Honorary Tennessean, and Military Officers Association of America. He is a charter officer of the Texas Genealogical College. Mrs. Nesbitt is the Governor Emerita of the Jamestowne Society. In 1992 she received the SAR Silver Good Citizenship Medal. She is a 14th Generation descendant of Captain Samuel Maycock, a member of the first legislative assembly in Jamestowne, VA in 1619. She was the organizing Governor General of Descendants of Colonial Cavaliers; President of First Families of SC; Secretary of First Families of VA; and was an organizing member of the Hereditary Societies of the US. She has been recognized for her leadership by inclusion in Who’s Who in America and many other biographical works. Mrs. Young has been an active member of the National Society Daughters of the American Revolution for 39 years. 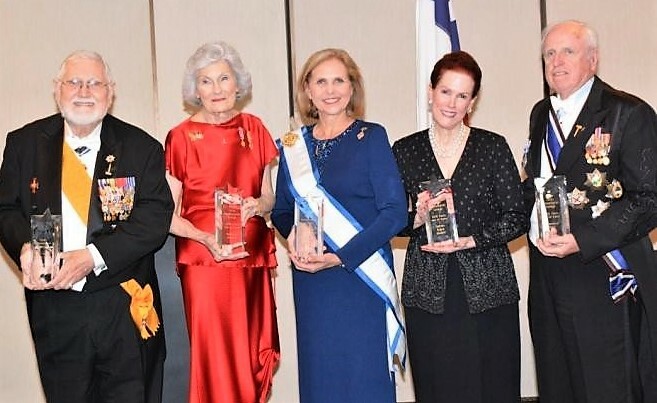 She served as State Regent of the Texas Society DAR (2006-2009); as Recording Secretary General NSDAR (2010-2013); and as President General NSDAR (2013-16). As President General, she was responsible for a staff of more than 140 employees. Highlights of her administration included celebrating the 125th anniversary of the founding of NSDAR, the first DAR Day of Service and achieving the Guinness World RecordTM for patriotism during the 125th Continental Congress. Further, the generous support of members established the first permanent endowment fund for the preservation, restoration and conservation of DAR’s historic headquarters near the White House. Lynn and her husband are active volunteers in their community and were recently recognized for restoration of a historic cemetery on their ranch in Milam County. Mrs. Young is a co-founder and President Elect of the Texas Genealogical College.